Card games are extremely difficult to make, in my estimation: the game has to provide a rigid set of rules, while having to deal with randomness in a way that feels fair while reveling in the entropy that comes from not knowing what’s next. 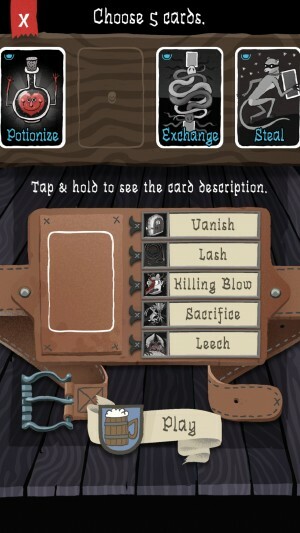 I don’t know if Card Crawl ($4.99) ever completely succeeds in that respect in terms of fairness with the randomness. But it does an excellent enough job otherwise at making a game that’s super-fun with an interesting set of rules that I struggle to put this one down. 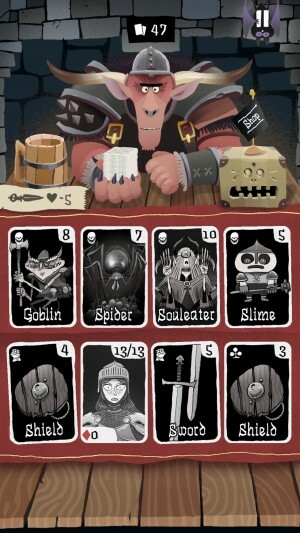 The game plays with a 54-card deck, based on a 52-card deck (not counting the 2 jokers), where you have a player card, two hands, and a backpack slot for items. Cards that are drawn consist of swords, shields, potions, coins, enemies, and five ability cards randomly selected from the ones you have unlocked. Four cards are drawn at a time, and you must play 3 of the drawn ones in order to draw another 3, hopefully getting to the point where no cards are left without running out of health from enemy attacks first. There are two key goals to each game, one of which is surviving but the other is coming out with as much money as possible. You can sell item cards you don’t want, getting coins back for how many points the card was worth, and you can discard coin and ability cards for no penalty. As such, sometimes a draw with a lot of items can be a bad thing, because you may have to sell or discard a valuable item, which could hurt you later on. And if you’re playing for high scores, then you need to be going for every coin card you can, and selling items whenever possible. Card Crawl has a great balance this way, in that not every item is explicitly good and not every enemy is explicitly bad. When you can use a Sacrifice card by taking damage from smaller enemies and then using that ability card to blow away a Souleater with 10 health, then using a potion to get back to full health, it feels very rewarding. Setting up these moments when you have an idea as to what’s coming up next, but don’t know exactly, is suspenseful and part of the fun. It really nails that hybrid between feeling like a dungeon crawler in terms of theme, but with a card game rule set. I’d love to see this game adapted to actual physical cards in some form. I think it could be done since the decks are standardized except for the ability cards. 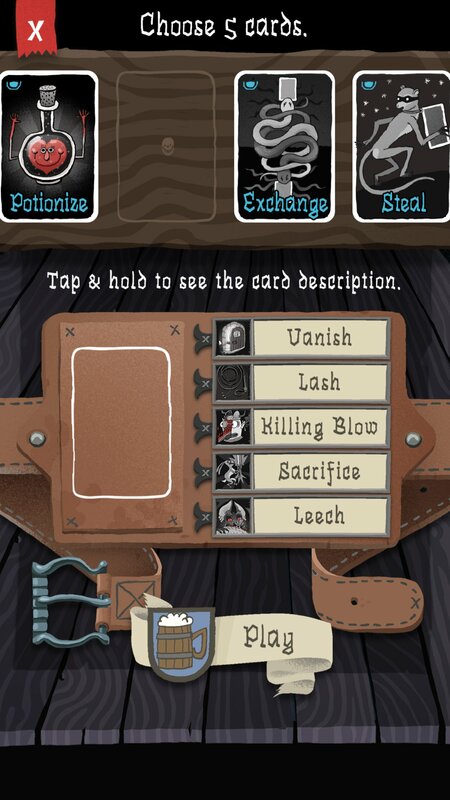 Your score grants you coins which can be used to unlock new ability cards, with no in-app purchases at all. I like that there’s both the normal mode where the ability cards are random, and constructed mode, which gives you a degree of strategization as to the 5 ability cards you can take into battle, but with its own leaderboard. Each high score table shows the 5 ability cards you were given to play with. I gravitate toward normal as there’s less thought involved to just get a random deck and go, though constructed mode does feel a bit more satisfying. But the counterpoint to that is in normal mode being the one that teaches players how to use the myriad ability cards. 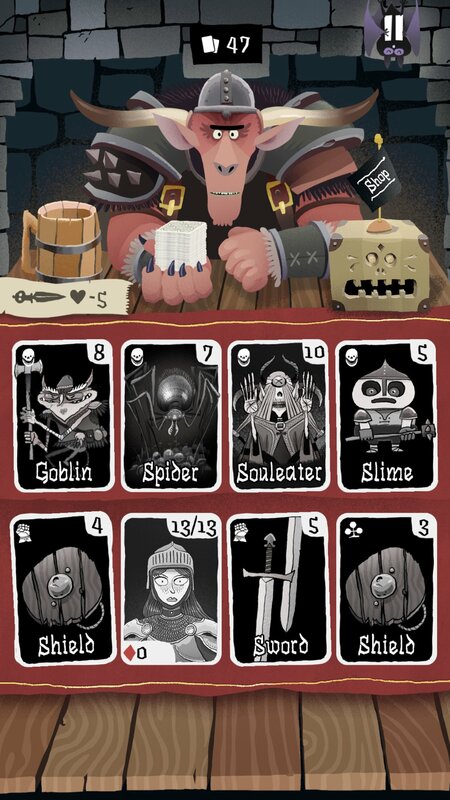 Card Crawl is a perfect game for one-handed iPhone play, as sessions are quite short, only taking a couple minutes to play a round, and the interface works great with just a thumb, even on the 6 Plus. It’s way too easy to get sucked in with game after game on here, because you can just sit back and play endlessly with your phone in one hand while watching TV, or procrastinating on doing something else. It hits a real sweet spot between engaging yet relaxed. The big concern I have with the game is if it’s entirely fair. The problem is that because of the card draw, it can be quite possible to get hands that are impossible to win with. Really, there’s nothing stopping the game from dealing out 3 hands in a row where you are doomed. If you get a poor cluster of cards, it could spell your doom. Card counting is probably quite important so that you know what’s still to come and what is not. I do wonder if every game is winnable, but for certain there are some games where it would require super-intelligent play in order to do so. And since any sufficiently advanced technology is indistinguishable from magic, there might not be a real difference between “practically impossible" and “actually impossible" for many folks. It puts a bit of a damper on the experience because it’s so clever. But I suppose half the fun of a card game is the randomness, and the Constructed mode does come in if you want to reduce that. Still, it’s a game where you’re going to have to accept that the luck of the draw will play a huge role in if you win or not.And the more risks you take, the less likely you are to win, but also the less likely you are to get high scores. I imagine constructed mode will actually be the game for experts to go for, because you can get some killer strategies going with some ability cards, as compared to others. Potionize has limited utility to me, for example, because shields and swords will ideally reduce damage instead of just heal it, so it’s a card with very limited use cases. Meanwhile, something like Lash can be killer with the right draw, and Killing Blow is powerful if you happen to get a 2 Sword and a Souleater to take out. 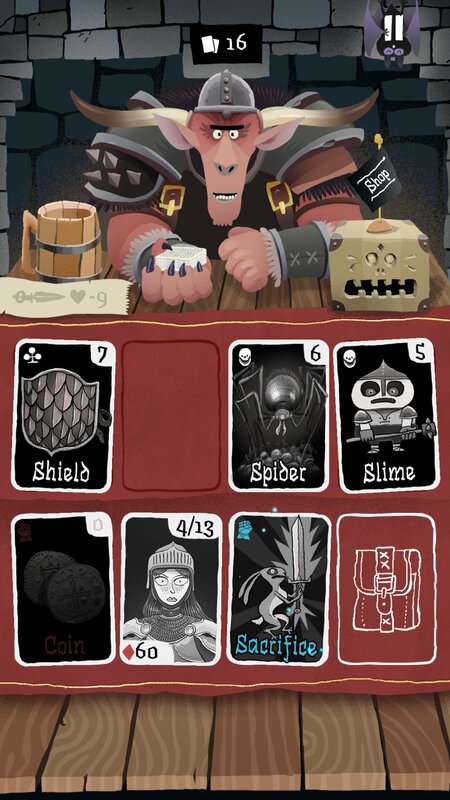 I think that as long as you have patience for the inherent randomness of playing card games, you’ll love Card Crawl‘s dungeon-y twist on things. It’s got great art, gameplay with cards that isn’t like other card-based dungeon crawlers (a surprisingly burgeoning genre), and is perfect for sitting back and relaxing while playing it. I highly recommend checking this one out.